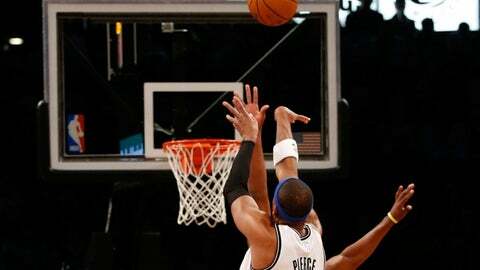 Brooklyn Nets small forward Paul Pierce (34) shoots during the first quarter against the Cleveland Cavaliers at Barclays Center. NEW YORK (AP) — Giving up a big run no longer means giving up for the Brooklyn Nets. The team that not long ago was accused by its coach of accepting losing is now showing a willingness to fight. "We’re not buckling, we’re not getting down, have a bad stretch and let’s give in," center Andray Blatche said. "We’re fighting and we’re competing." Deron Williams scored 21 points, Paul Pierce added 17 while moving past Allen Iverson into 19th place on the NBA’s career scoring list, and the Nets beat the Cleveland Cavaliers 89-82 on Saturday night. Blatche had 12 points in his return from a four-game absence as the Nets won their second straight, just their second winning streak of the season. They limited a Cleveland team playing without star guard Kyrie Irving to 37 percent shooting — 19 percent in the final period — and matched their best defensive performance of the season. "He’s our best player, especially when it comes to scoring the basketball. So you miss his 22 points a game," Cavs coach Mike Brown said. "But I give our guys credit. They competed in the second half. We had a chance to win it. We took the lead, we just couldn’t hold on. You miss a guy of his capabilities especially down the stretch in situations like this." Reggie Evans had eight points and 11 rebounds for the Nets while starting in place of Kevin Garnett, who was given a night to rest with the Nets beginning a stretch of five games in eight days. The Nets gave up a double-digit lead with another poor third quarter, which has been a season-long problem. Only this time, they shook it off with a strong fourth, holding Cleveland to 4-of-21 shooting. We’re fighting and we’re competing. "Normally a third-quarter run on us tends to be a downfall, but tonight’s game was a positive," Nets coach Jason Kidd said. "Guys stayed together. We got stops and then we executed on the other end." Dion Waiters scored 26 points for the Cavaliers, who played without Irving for the second straight game because of his bruised left knee. They beat Orlando in overtime on Thursday but didn’t have nearly enough firepower in this one, losing for the seventh time in eight games. "It’s not frustrating," Waiters said. "We win four or five big games, we’re right back in the playoff hunt. I mean, don’t get me wrong, the East is just not doing good." Coming off a 95-93 victory at Oklahoma City on Joe Johnson’s jumper at the buzzer, the Nets returned to Brooklyn to open their longest homestand of the season, a four-game stretch that turns tougher with visits from Atlanta, Golden State and Miami. They welcomed back Blatche, who missed the previous four games for personal reasons and had consecutive baskets early in the fourth when the Nets took control for good by scoring seven straight points to open a nine-point cushion. Pierce came in two points behind Iverson, who retired earlier this season, and now has 24,383 points since entering the league as the No. 10 pick in the 1998 draft. "It’s just a tribute to my longevity, just being able to stay healthy, continue to work on my craft and playing with a lot of good teammates over the years," Pierce said. Evans was 3 for 4 for eight points in the first quarter, surpassing his season high of five points and helping the Nets take a 22-17 lead. It grew to 48-34 when Williams capped a 13-3 spurt with a 3-pointer with 1:51 left in the half, and Brooklyn was ahead 51-38 at the break. We win four or five big games, we’re right back in the playoff hunt. But the Nets managed one basket during a span of nearly 9 minutes of the third quarter, while the Cavaliers outscored them 20-4 to take a 61-58 edge on Matthew Dellavedova’s 3-pointer with 1:51 remaining. Brooklyn regrouped to take a 67-65 advantage to the fourth. C.J. Miles scored 19 for Cleveland but shot 6 of 19. Notes: Nets center Brook Lopez had surgery Saturday on his broken right foot. Besides repairing the fractured fifth metatarsal, surgeons also repositioned another bone. Nets medical director Dr. Riley Williams III said in a statement that part of the procedure "lessens the stress on the fractured bone, and decreases the likelihood of re-injury in the future." Lopez was averaging a team-high 20.7 points when he broke the foot for the second time in three seasons on Dec. 20.